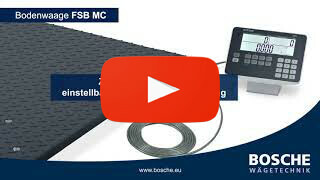 Product information "Floor scale FSB MC"
The floor scales of the BOSCHE FSB range are ideally suited for use in harsh industrial environments. FSB MC is a powerful floor-counting scale, which is suitable for complex counting applications. The FSB MC floor scale is a precise counting scale for fast counting of parts with equal weight. You can determine unknown quantities, check known quantities and commission. Three displays for weight, piece weight and quantity show you all the information at a glance. The combination of the weighing platform with the high-quality Display MCI is provided for complex counting tasks, with or without calibration. Operation of the device via the membrane keypad is intuitive and easy to learn – even for untrained staff. Due to their solid construction, floor scales are intended for stationary use.t. The scales can be easily assembled or transported using the eye bolts supplied. On-floor installation: Suitable for companies that use forklift trucks. A base frame set is compulsory for verified scales in accordance with the Weights and Measures Act. On-floor installation with ramps: Suitable for companies that use pallet trucks. You can use one ramp for access on to the scales or two for access on and off the other side. In-floor installation: Suitable for companies that use both forklift trucks and pallet trucks. With this installation option, the scales platform is installed in the floor using a pit frame. A drawing can be supplied for these pit scales. The platforms are fitted with four high-quality DMS load cells. Related links to "Floor scale FSB MC"
Our comment on "Floor scale FSB MC"